By placing an order with Naked Wines you are confirming that you are 18 or older. It is illegal for us to sell alcohol to anyone under the age of 18. When you give Naked Wines your credit or debit card details you are confirming that you are either the card holder, or that you have permission from the card holder to use the card for the purpose of ordering wine. N.B. If you're claiming a free case of wine, gifted by one of our partners for example, you will still need to provide us with card details - even if we're not charging you anything. No payment will be taken from your card until the goods you have ordered are dispatched from our warehouse, or your monthly Angels payment / MarketPlace payment (if appropriate) is due. Please note, when you place an order, we will securely store your card details so it's easier for you to place any future orders, but we will never take payment from your card unless you authorise us to do so. Our standard delivery service is next day (Monday to Saturday) to most UK addresses, when you order before 5pm. The delivery charge is £4.99 OR it's free if you spend £100 or more. We also offer guaranteed delivery before noon on Saturday for £6.99. N.B. Some sale cases may be exempt from free delivery (which we'll make clear on the website) - and if you're using a voucher or a gift card to buy your wine, or claiming a free bottle, you have to spend £100 of your own money to qualify for free delivery. If we are swamped with orders, we will bring the 5pm cut-off forward so that we can keep our promise to the customers who have already ordered. We are unable to guarantee delivery dates to some areas of the UK (see the full list of out-of-area postcodes listed here. If your order goes missing, or is damaged, between dispatch and delivery, we will send you a replacement order as soon as we can. If we are unable to dispatch replacement goods within 7 days we will offer you a full refund. For these purposes, delivery takes place when products are left at your delivery address or with someone else in accordance with your instructions. For your own safety we reserve the right to contact your card issuer for the purposes of carrying out security checks. There are certain products, such as pre-order deposits and tasting tickets, where you can only use cash to buy them. By cash we mean money you've deposited into your Naked Wines account, Fine Wine Bond interest or payment by credit / debit card. If you have any additional credits in your account, these won't come off the value of your order if ordering these products. If for some reason we are unable to fulfil your exact order, we reserve the right to substitute up to 3 bottles with similar wines of at least the same value as the wine you ordered. Of course, the 3 substitute bottles are covered by our money back guarantee as set out below. If we need to substitute more than 3 bottles in any one order we will put your order on hold and contact you for further instructions. All of our wines are covered by our money-back-guarantee i.e. if you're unhappy with the wines then we'll give you your money back. Please note that if you need to return your wines to us, we'll either arrange collection or we're happy to collect from a local Majestic (just drop us a call first). So the recipient knows who the gift is from, you agree to your name and postcode being shown under your personal message for gifts you send from Naked Wines. The message and your details can't be seen in transit, and are only revealed when the recipient peels back the gift message label to read your personal message underneath. Our vouchers are for first time customers only (apart from a handful of exceptions) and they can be redeemed online or over the phone. They cannot be combined with any other offer or promotion (Angel prices for example) and they're one voucher per person (i.e. we can't stack them otherwise we'd be giving too much wine away!). BUT please note, the minimum spend does vary from voucher to voucher so please refer to the voucher itself. Before you get spending, you'll have to register with us first, including email address and credit/debit card details. We'll use your card details to verify your age in addition to taking payment. Your voucher can be used against the vast majority of cases on our site (we will make it clear if you can't) - as long as it hits the minimum spend. And please see voucher for any expiry date that may apply. As with all orders, if you're not happy with any of the wines for any reason, we will give you your money back! Our gift vouchers / gift cards, can be redeemed online or over the phone by new or existing customers (unless otherwise stated on your voucher). They cannot be combined with any other offer (Angel prices for example) and they're one voucher per person (i.e. we can't stack them). Before you get spending, you'll have to register with us first, including credit / debit card details (even if you're not spending any of your own money), so we can verify your age, check where to send the wine to - and take any necessary payment. Your gift voucher can be used against the vast majority of cases on our site (we will make it clear if you can't). If you want to top-up your spend i.e. your wine and delivery comes to more than the value of your voucher, we will charge the outstanding balance to your registered credit / debit card (OR use up any existing account balance if applicable). N.B. If you don't use the full balance of your gift voucher in the one transaction, you will lose any outstanding balance, so it's best to spend it all upfront! And please see voucher for any expiry date that may apply. Naked Wines Gift Certificates can be bought online or over the phone, to pass onto a friend. N.B. These differ to the vouchers / gift cards mentioned above, which are offered by our partners as a reward or thank you. These gift certificates are like cash (i.e. can be used to buy anything on the site) - and we'll send the certificate to the lucky recipient via email, with full instructions on how to claim it. They can be stacked (unlike our partner vouchers / gift cards) - and they can be used in conjunction with partner vouchers / gift cards. Before claiming a gift certificate, you'll have to register with us first, including credit / debit card details (even if you're not spending any of your own money), so we can verify your age and we know where to send your wine to. We honour vouchers honestly earned from our partners, but the majority of our money-off vouchers (and some of our gift vouchers) are for new customers only. So if you're an existing customer who has already used a voucher, you won't be able to redeem a second one, but you're welcome to pass it to a friend!. N.B. We reserve the right to close your account(s!) if we suspect that you are downloading and redeeming vouchers from a voucher site, EVEN IF you set-up multiple accounts in the name of your pet hamster and vole. It is just not fair on us, our winemakers and other customers. We reserve the right to modify or cancel our vouchers/offers without notice. If you post a comment on any of the public walls around the site (i.e. the Winemaker walls, the Wine Page walls and your Naked Me profile wall), your comments will be in the public domain and will therefore be visible to anyone who visits the site. Again, wine ratings and comments posted on your 'Naked Me' profile page will be fed through to the relevant wine page, and therefore visible to anyone who visits the site. If you don't want your Naked Me wall conversations to be visible, then please set your profile to 'private'. When you become a Naked Angel, you'll be helping our network of talented winemakers to make delicious wines, for less. You support them by investing £20 a month (or any multiple of £10) into your Naked Wines account towards your next order, yours to spend on ANY of our wines, whenever you want. In return for your support, you save at least 25% (and up to 50%) every time you order (i.e. you pay the Angel Price rather than the normal price listed next to each product, unless you're using a money-off voucher - see point 6 below). Angels are also offered a free premium bottle of wine every month if you order a case, while stocks last. To claim your free bottle, add it to your basket from your Naked Me page (unless we've added it already!) and checkout with at least 11 or 12 other non-MarketPlace bottles. There is no obligation to order whatsoever. You decide when you want to order (if at all!) and what you want to order. Your monthly payments will be transferred from your registered debit or credit card at the same time every month (you can change your payment date on your My Account page). N.B. If we cannot take your monthly payment from your default card for whatever reason (for example, the card has expired), we will attempt to auto-update your card details for you, to save you the bother of having to call us with updated information. Failing that, we will automatically take your Angel payment from another registered card on your account. Or finally, we will get in touch and request new card details! Please note, once we have new card details, we will take your Angel payment for that calender month and the previous calendar month, unless you tell us not to. If you place an order that totals more than the balance in your Naked Wines account, then we will debit your registered debit / credit card the difference. VOUCHERS AND GIFT CARDS: If you have a promotional money-off voucher in your account, or a gift voucher / gift card, these are only redeemable against the standard price, not the Angel price, unless otherwise stated. N.B. If we offer you a voucher when you join our Angel waiting list, these are valid against the standard price whilst you're on the waiting list, OR the Angel price as soon as you get your wings. GIFT CERTIFICATES: As these are like money, there is no Angel discount when buying Naked Wines Gift Certificates BUT you will still receive your Angel discount when you spend a gift voucher. You can cancel your Naked Angel Account at any time, and get your money back - with no penalty whatsoever (see point 9). You can cancel online on your account page, via email at hello@nakedwines.com OR by calling us on 01603 281869. Please note, that if you have any vouchers OR Fine Wine Bond Wine Credits in your account, we cannot refund these - as they are not cash nor are they convertible into cash. But as mentioned above, you will get back every unspent penny that you've paid in! In case you were wondering whether the money in your Naked Wines' account is safe; the funds are protected by our ultimate parent company guarantee so that if anything goes wrong with Naked Wines your money remains secure. Closing an Angels account when someone dies: we understand that it can be overwhelming to sort practical matters when someone close to you dies so we want to make it as simple as possible. Call us on 01603 281869 and we'll do our best to help. If the bank account linked to the Angels account is still active or even if frozen we can return any remaining funds immediately. If this is not possible we will require a copy of the death certificate and proof of executor details before we can release any funds to the executor by cheque. What does Angel exclusive mean? Angel exclusive means that Angels will always get first dibs on all new products as soon as they hit the website (usually around four weeks). They'll also get priority access to low stock / scarce wines - and some of our most popular wines. Once Angels have had first dibs, these products will be released to all customers to purchase at the list price, however Angels will always have a chance to buy them first. I'm on the Angel waiting list, are there any conditions? None whatsoever. If you join the waiting list, you can leave at any point (although it means you'll be put to the back of the queue if you want to join again). We'll email you during your time on the waiting list to confirm your place on the list, remind you how it works - and let you know when your membership is due to start. Remember, once you become an Angel, you can cancel and get any unspent money back if it's not your cup of tea - so there's absolutely no risk. N.B. If we offer you a reward when you join the waiting list (for example some free wine or a voucher) - any conditions surrounding this reward will be made clear at the time. Each deal lasts for one week and the deal ONLY goes through if the minimum number of cases are sold i.e. "This Pinot Noir usually sells for £20 a bottle in New Zealand, but I'll sell it to you for £10 a bottle if 1000 of you buy a case." Customers can bid for as many cases of the same deal as they like (N.B. you will need to register with Naked Wines to place a bid). If, when the deal ends, the number of bids exceeds the minimum, then the deal is binding on all parties! And Naked Wines will pay the pitch price, in local currency, at the exchange rate prevailing, within 10 days of the seller delivering the wine and export documentation to Naked Wines' specified agent. If the deal expires and the minimum volume has not been achieved, then nothing happens. The seller does not deliver the wine, get any money OR get charged any money - and the customer is not charged anything and does not receive any wine. Angels: There is no additional Angel discount on MarketPlace cases as they already have HUGE discounts - and most of the winemakers don't need Angel backing as the majority of the wines are already made. Delivery: Delivery is included in the price that you bid - so there's no extra delivery charge to pay. N.B. Out of area postcodes will be charged their standard delivery charge, less £5. Vouchers: You cannot use vouchers on these cases as they already have HUGE discounts - and the transaction is really between you and the winemaker, not between you and Naked Wines. For a full list of Q and As, please click here. We may invite you to pre-order wines that are currently out of stock, for future delivery. We typically ask you to put down a £10 deposit to secure 6 bottles. You can pay your deposit using your registered card, any cash in your Naked Wines account or any Fine Wine Bond interest (you can't use vouchers or account credits). When the wine is on its way, we'll email you to remind you that you've pre-ordered a case - and we'll tell you when it's due and how much balance you owe (which you'll pay when we ship you the wine). If you've changed your mind, you can cancel your order - and we'll give you your £10 deposit back. Our standard money-back guarantee also applies i.e. we'll give you a refund if you don't love the wine. Please note that when we ship you your case, we cannot add any additional bottles, including your free monthly sample. Delivery charges are standard i.e. free to most UK postcodes if the wine is £100 or more. As of the start of August 2015, we've introduced a new service where customers can order wine via text message! This service will runs (Mon-Fri 9am-5:30pm, Sat 9am-1pm) - and we'll aim to reply to all texts within 20 minutes. To use this service, you have to register with Naked Wines (including address and card details) and you need to opt-in, which you can do so here. Please note that you have to register via the main site or the mobile site. You cannot currently register via the app. When you opt-in to the service, you'll have to provide us with a mobile phone number, which we'll store securely with your other personal details. Once you've opted-in, we'll text you a verification code which you'll need to input on the website. And once we've received this code, we'll confirm the number you can use to place orders! The beauty of the service is you can ask us to order you a specific case OR you can tell us the types of wines you like and we'll create a case for you. We'll use the default card on your account to pay for your order (or any account balance), and we'll deliver to your standard delivery address unless you tell us otherwise. Delivery charges are free if you spend £100 or more, otherwise £4.99. We won't text you about any other offers etc unless you agree to this - and any texts you send will cost you your standard network rate (texts sent by us are free). Our Naked Beer subscribers receive a selection of craft beers from small, independent UK breweries. Each case contains 20 bottles is delivered quarterly. You can sign up here. The price of the case (£49.99) will be debited from your registered credit / debit card when each case is shipped. Or if you have any Angel balance sitting in your account, we'll use that up first (excluding any vouchers, which cannot be used towards beer cases). Delivery for quarterly cases is always free! We'll email you roughly 7 days before each case is due so if the timing's not right, you can postpone your order by a month or skip a quarterly case. If you skip your case you’ll receive an email in 3 months when the next quarter’s subscription box is ready to go to check you’re ready. There’s no limit to how many times you can skip a case- you’re in control. Please note, unfortunately you can't add any additional bottles to your Naked Beer Subscription box as it’s shipped in a special beer only box that’s just the right size. You can cancel your membership and get your money back at any time if you're not happy - Just email help@nakedwines.com and we’ll do the rest. Our Naked Fine Wine Discovery Club members receive a selection of fine wines every other month, along with full winemaking and tasting notes to swot up while you drink! The introductory 4-pack costs £60 and will be debited from your registered credit / debit card when each case is shipped. Or if you have any Angel balance sitting in your account, we'll use that up first (excluding any vouchers). Subsequent cases contain 6 bottles and cost £90. Delivery for Fine Wine Discovery Club cases is always free! We'll email you roughly 7 days before each case is due so if the timing's not right, you can postpone your order by a month or skip a case. If you skip your case you’ll receive an email in 2 months when the next case is ready to check you’d like us to send it. There’s no limit to how many times you can skip a case - you’re in control. Unfortunately you can't add any additional bottles to your case as it is specially packed just for Fine Wine Discovery Club members. You can cancel your membership to the club and get your money back at any time if you're not happy - just email help@nakedwines.com and we’ll do the rest. Our beers are pre-packed into custom made boxes so unfortunately case contents cannot be changed. Wine ordered alongside beer cases will be shipped in a separate case (standard delivery conditions apply e.g. minimum order of 6 bottles, or 12 bottles in order to claim your monthly free bottle of wine). All our beers are covered by our money back guarantee, i.e. if you're unhappy with the beers then we'll give you your money back. We will offer a credit for any beers you do not like, and a refund for any faulty beers. Vouchers cannot be claimed against beer cases. Our standard delivery service (i.e. next working day) does not apply to certain postcodes. Please see below for a list of exceptions. Also, please note that we don't offer Saturday delivery to any of the postcodes listed below. Orders to the following postcodes take 2 days to arrive: AB10 to AB56, AB99, BT1 to BT49, BT51 to BT58, BT60 to BT71, BT74 to BT82, BT92 to BT94, DD6 to DD11, EH35 to EH46, FK18 to FK21, IM1 to IM9, IM99, IV1 to IV28, IV30 to IV32, IV36, IV40, IV52 to IV54, IV63, KA27, KA28, KW1 to KW3, KW5 to KW14, KY9, KY10, KY15, KY16, PA20 to PA33, PA35 to PA 38, PA49, PH5 to PH26, PH30 to PH39, PH49, PH50, PO30 to PO41, TD1 to TD14. Orders to the following postcodes take 3 days to arrive: TR21 to TR25. Orders to the following postcodes take up to 4 days to arrive or a little longer in very remote areas: HS1 to HS9, IV41 to IV49, IV51, IV55, IV56, KW15 to KW17, PA34, PA41 to PA48, PA60 to PA78, PA80, PH40 to PH44, ZE1 to ZE3. We are unable to accept orders to either JE or GY postcodes. We'll offer this as an option on the checkout page, so look out for a big blue button! When collecting your wines, you'll need to give the Majestic store staff your email address and your order number, to prove you've paid for the wines. Please note, you still need to place your order on the Naked Wines site i.e. you cannot order Naked wines in Majestic stores. And we'll send you a second email once they've arrived at the Majestic store, so you know they're ready to collect. N.B. If you want to cancel your order once you've placed it, you should still contact Naked Wines directly - rather than your local Majestic store. In common with most websites, www.nakedwines.com uses "cookies". Cookies are small snippets of text that are stored on your computer. When you request a page from our website, the cookies are sent to our web server, and when we send a page back to you our server may add to or change these cookies. Without cookies, we would not be able to know that you are the same person from page to page. Additionally, we have partnerships with some carefully chosen third party services which involve including some code on our website, for example so that we can measure the effectiveness of our marketing activities ,enable you to share content with your friends or login via a social media account. In some cases these partners may also store and retrieve their own cookies on your computer. Cookies set by websites other than www.nakedwines.com are known as "third party cookies". In accordance with the Directive on Privacy and Electronic Communications 2003 and General Data Protection Regulation 2018 (GDPR), and to be as open and transparent as possible, we have provided more information on the cookies in use on our website here. These details may change over time as we continue to develop our website. You can change the settings in your web browser to allow or deny different websites from setting cookies. www.nakedwines.com rememberme User Experience - Allows us to identify customers across sessions. www.nakedwines.com cid User Experience - remembers which country (US or UK) you want to see. Every Angel is invited to send a welcome deal to their friends who don't currently shop with Naked Wines, via email, Facebook and Twitter. This deal may vary, but you can find the details via the 'Invite a friend' link in the menu once logged-in, or by visiting www.nakedwines.com/invite. You can send the deal to as many friends as you like, as often as you like, but your friends will only be able to redeem the deal if they're new to Naked Wines. By inviting a friend, you confirm that you have their consent for us to email them their offer code, plus one reminder. They have 30 days to claim - after that, we’ll delete their data. For every friend that orders off the back of your invite, we will credit your Naked Wines account with £10 as soon as their order is shipped. This £10 credit is like cash i.e. it has no minimum spend and can be used against any products on the website. N.B. If you decide to cancel your Naked Wines account, this money won't be refunded to you (just any unspent money you've paid in yourself). Please note, Naked Wines reserves the right to withdraw the £10 credit offer at any time, or change the amount (but if the deal changes, we will make it clear on the 'Invite a friend' page). If you're new to Naked Wines, you're welcome to redeem any 'Invite a friend' deal sent to you by an existing Naked Wines customer. If you have been invited, we'll send you an email with an offer, and one further email reminder. If you don't claim the offer, we'll remove your information from our database after 30 days. The details and conditions of the deal will be explained in the invite. The deal cannot be used in conjunction with any other offer or voucher. If you take up the deal, you're under no obligation to buy again or become an Angel (i.e. a member), but we will invite you to become an one. If you do decide to order and you don't like the wines, the service or anything else, you're entitled to a full refund as part of our money-back-guarantee. We use a third party provider, Adestra, to deliver our marketing emails. We gather statistics around email opening and clicks using industry standard technologies. Open tracking uses a one pixel by one pixel clear GIF image, which is stored as a temporary file on the user's computer or mobile device. When this image is downloaded, Adestra registers the email recipient as having opened an email. This is not used for any other tracking, except for tracking an email open. Our Wine Concierge service is the perfect solution for busy folk who’d like someone to do their wine shopping for them. It’s our job to make sure you have a wine rack full of wines you’re going to love, and as a Wine Concierge member, you only pay us when we get it right (if we offer you 'Try Before You Buy' - more on that below!). You can sit back and let us do everything for you, or you can be really specific if you want to. Plus how many bottles you’d like to receive in each case (12, 15 or 18). We’ll send your wine to your default delivery address (which you can update at any time here). If the timing isn't right, you’re welcome to postpone or skip your case. Plus, if you don’t like the sound of the wines we’ve chosen for you, you can edit your case online or by contacting our Customer Happiness Team before we pop them in the post. We also reserve the right to cancel your Concierge membership at any point if we don't think we're right for one another. For our full standard terms and conditions, please take a look here. What will my Wine Concierge cases cost? If you're on 'Try Before You Buy', you've got nothing to pay upfront! We'll bill you 30 days after we've shipped you your wines (or the day after you’ve been online and told us what you think of all the wines in your case, if earlier), and then you'll pay the list price for each of the wines in your case. 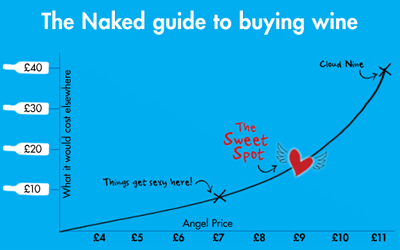 If you're an Angel and pay £20 a month into your Naked Wines account (or if you become an Angel), then you get preferential prices and you pay the Angel price for each of the wines in your case. When you pop your name down for Wine Concierge, we’ll ask you to tell us the average amount you typically spend on a bottle: between £7 and £10, between £10 and £15, or over £15, and every time you need a top up, we’ll suggest a case we think you’re going to love based on these price-points and your personal preferences. If the price of the recommended case is too much (or too little), we can change your case for you. N.B. If you’re a Majestic customer invited to get Naked, you'll also be entitled to Angel prices. Most Wine Concierge cases come with free delivery! If you’re new to Naked Wines or if you’re an existing customer ordering a 6-bottle Wine Concierge welcome pack, you may be asked to pay delivery on your first case depending on the case size and offer. The delivery charge will be made clear at the time of purchase. What if I want to change the frequency or size of my cases? As above, you can change the case size, colour, frequency and price-settings of your Wine Concierge cases in your account page here. Or you can drop us a line and we’ll do it for you. How are you so confident you’ll send me wines I’m going to love? Every time you use our website or app to tell us whether you’d buy one of our wines again or not, we get to know you and your tastes a little bit better. If you’ve been with us for a while, we’ve created a whizzy algorithm based on your personal preferences, that does all the thinking for you - and picks wines you’ve already told us you love OR wines with a similar style profile. Equally, it avoids wines you’ve told us you didn’t enjoy - and those that are similar. If you’re new to Naked Wines, the more you tell us what you enjoy, the better the recommendations going forward! So please download our app or hop onto your Naked Me page to give your wines a thumbs up or thumbs down. N.B. Our app is currently available to Angels only. Will I still get all of my Angel perks alongside my Concierge cases? If you’re an Angel, you’ll only ever pay Angel prices - both on your Wine Concierge cases and when you make ad-hoc purchases yourself! Plus, you’ll still be offered a free sample every month (which you’re welcome to claim on non-Concierge orders as usual), get first dibs on new parcels - and keep all your other perks. N.B. You won’t be able to add your free bottle to your Concierge cases as our warehouse team pick and pack these cases separately. As part of our Wine Concierge service, we will offer some customers the option to Try Before You Buy, on both their welcome case and ongoing cases. What’s Try Before You Buy? It’s exactly as it sounds! You buy a case of wine, you pay a delivery charge if it applies, you drink the wines and tell us what you think, and we’ll only charge you for those you love. Why are we offering this? You’re putting your trust in us... and letting us do your shopping for you. So it seems only fair you try before you part with your hard-earned cash! How do we know what you enjoyed? Download our app where you can scan and tell us what you think of your wines (or hop onto your Naked Me page on the site) - and give each of your wines a thumbs up OR a thumbs down. For every wine you give a thumbs down to, we knock the price off the total to pay - and we make sure we never send it to you again (or anything similar!). N.B. Our app is currently available to Angels only. At what point do we take payment? We’ll take payment 30 days after your order ships, OR at the point you’ve used our website or app to give a thumbs up or thumbs down to all of your wines, whichever is the earliest. If you’ve not had a chance to drink and tell us what you think of all of your wines within 30 days, we will take payment on the 30th day, but our usual commitment still applies, i.e. if you tell us you didn’t enjoy something at a later date, we will give you your money back. Where will we take payment from? We will take payment from your registered debit / credit card. We’ll give you the heads up before processing the transaction - and will let you know once we’ve taken the monies. If for any reason we can’t take payment (i.e. your card has expired for example), we’ll use any back-up cards registered on your account or we’ll be in touch to request new card details. If you’re offered Try Before You Buy, but you’d prefer to pay what you owe upfront, you can edit your payment settings by giving us a call, after you've received your sign-up case. And don’t worry, we will still offer you your money back if you pay for something you don’t love! If we’ve offered you an introductory case for a total spend of £4.99* (equivalent to our standard delivery charge), you will only pay that amount for the wines in that case, including the delivery charge. Please note: we reserve the right to withdraw our offer of Try Before You Buy at any point and we reserve the right to take funds earlier than the 30th day if we see fit. If you’re not offered Try Before You Buy, you will pay for your Wine Concierge cases at the point your wine ships. But rest assured, our standard money back guarantee still stands, i.e. we will refund you for anything that isn’t your cup of tea - so there’s still absolutely no risk! If we've offered you an introductory voucher for Wine Concierge, our standard voucher terms and conditions apply. The voucher holds no cash value, is non-transferable and not for sale, and due to licensing laws isn’t valid at Majestic Calais, or in Scotland, but Scottish customers are welcome to pop into their local Majestic store and receive a surprise treat. We'll do everything we can to resolve any complaint you may have. You can reach our Customer Happiness Team by phone on 01603 281869 or Live Chat (Mon-Fri 9am-5:30pm, Sat 9am-1pm). Alternatively, you can email us at help@nakedwines.com. As part of the recruitment process Naked Wines Ltd will process any personal data you have provided for the purposes of considering you for suitable employment vacancies, communicating with you at various stages in the selection process, for on-boarding successful applicants and for retaining the applications of unsuccessful applicants in the form of a “talent pool” database. Naked Wines Ltd will be acting as Data Controller for these purposes. The legal basis for our processing your information is the pursuit of our legitimate interests which are seeking job applicants in order to further the interests of our organisation and maintaining a database of unsuccessful candidates and speculative enquiries known as a talent pool. We will not process the information you have provided for any other purposes incompatible with those referred to above. We will not share or disclose your personal data to anyone else. The information you provide to us through this form and subsequently during the application process will be stored in our computer systems for a period of 365 days. You have the right to request access to, rectification or erasure of personal data that we hold about you as well as a right to object to and to a restriction of our processing of your personal data for the purposes described above. You may also lodge a complaint about us with the supervisory authority responsible for data protection.